Elizabeth's slave father belonged to another master, and they only saw him twice a year. Then he had to move to the West and she never saw him again. When she was four years old it was her duty to take care of the baby of her master Colonel Burwell and his wife. She was given a dress and a little white apron and was told she was little Elizabeth's "maid". When she was a teen-ager she suffered many lashings as her master's son with whom she was living tried to subdue what they called her "stubborn pride". When she was in her early twenties she was abused by a white man and bore a son, the only child she would ever have. She called him George. In spite of his parentage, she loved him dearly. She went to live with Mr. Garland who had married one of the Burwell daughters. When hard times came, they proposed putting Elizabeth's old mother to work. The thought of her mother having go to work upset Elizabeth greatly. She, at the age of seventeen began sewing fine dresses for the rich ladies in St. Louis. She did so well she was able to support seventeen people for 2 1/2 years with her work. She longed to gain her freedom. Her master offered to just let her leave, but she wanted to really be free. She wanted to know the price of real freedom. He told her it would cost $1200 dollars for herself and her boy. Several years passed and she still had not raised the necessary money. She married another slave, Mr. Keckley. She thought of going to New York to raise the money, but one of her patrons, Mrs. Le Bourgois (luh BOOR zhwah) in St. Louis came to her rescue and raised the money. Elizabeth was thirty-seven years old and her son George was about sixteen. 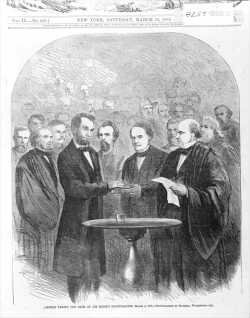 The day of her release was November 13, 1855. She had accepted the money as a loan and worked earnestly until it was all repaid. 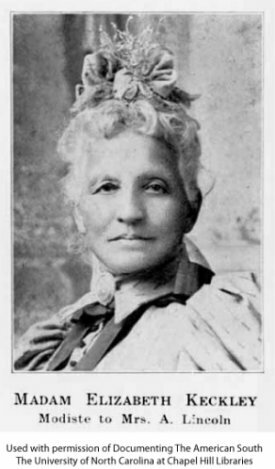 After about five years she left her husband who was an alcoholic, and she and George went to Baltimore where she sought to teach sewing classes. This was not successful, and she went on to Washington D.C. There she met Mrs. Davis, the wife of Senator Jefferson Davis, and became her modiste (mo DEEST), or dressmaker. Then she became Mrs. Capt. Lee's seamstress* and the orders started coming in for more dresses for Lizzie to make. A dress she made for a Mrs. McClean opened an important door for her. 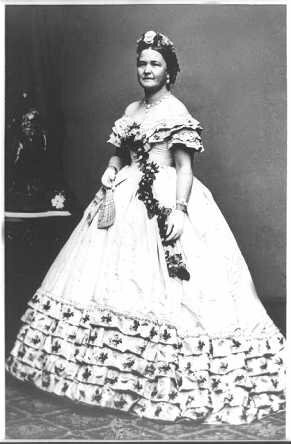 Mrs. McClean knew Mary Todd Lincoln, wife of President Abraham Lincoln. Elizabeth made a dress for Mrs. Lincoln which pleased the First Lady so well she hired her to become her dressmaker. She made 15 or 16 dresses for her that spring and summer. Mrs. Lincoln wanted to keep up appearances and was extravagant* in buying her wardrobe. One day an actress tried to bribe Elizabeth to help her get a job as a servant in the White House. The woman wanted to spy on the Lincoln family and write gossip articles about them. Elizabeth told her, "Madam you are mistaken in regard to my character. Sooner than betray the trust of a friend I would throw myself in the Potomac river". Elizabeth helped to care for Willie, the Lincoln's son after he became ill. The effect of Willie's death was so great, his mother was not able to attend the funeral. Elizabeth understood. She too had lost her son in the war. Mrs. Lincoln confided in her. Mary once told her about debts she had incurred. At that time she owed about $27,000, but at the time of the President's death she had store bills of $70,000. The President was unaware of his wife's debts. One day Elizabeth asked Mrs. Lincoln for a special favor. She asked for the right-hand glove the President would wear at his second inauguration, and Mrs. Lincoln honored her request. When President Lincoln was assassinated* Mrs. Lincoln immediately called for her confidante,* Elizabeth, to come to be with her. Within a few weeks Mrs. Lincoln moved to Chicago and insisted her friend go with her. She stayed for a while and then returned to Washington and opened her shop. 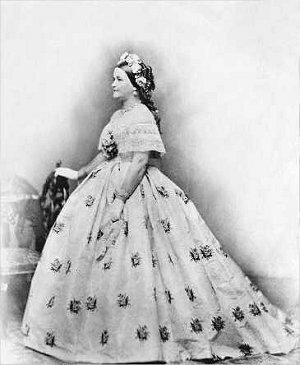 Mary Lincoln would have to sell the beautiful dresses Elizabeth had made for her. She didn't have enough money to live. Her strategy was to register in hotels under assumed names and put a heavy veil over her face in order to appear incognito. * People would come to look at and buy her clothing. Mrs. Lincoln eventually went to live with a family in a private home. As for Elizabeth, her book created such a furor* that Mrs. Lincoln's son had it removed from publication. Her intentions were good. 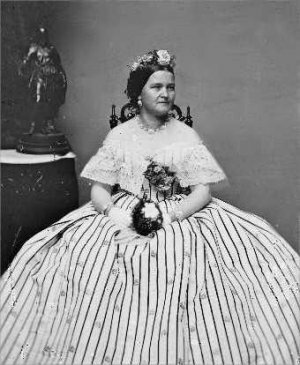 She wanted people to better understand her friend Mary Todd Lincoln, but many people looked at it as a "tell-all expose* "and thought the details were much too intimate. At the end of her life she was very poor and lived out her days in a house for destitute* women. She was 88 years old when she died. *Note: Usually you see Keckley spelled with the second e "Keckley". Jennifer Fleischner determined that the original spelling only had one "e". with one's identity concealed as by a false name or title Example: He was traveling incognito. 1 : lacking something needed or desirable Example: He was destitute of the necessities of life. 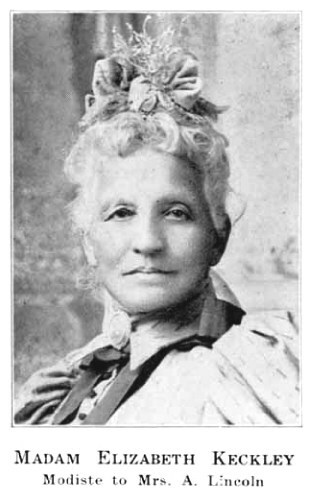 Press "Go" to search for books about Elizabeth Keckley. My name is Timothy Keckley: Elizabeth husband last name was Keckley.Was he a white man or black man. 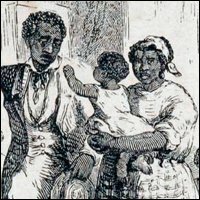 According to the biography when she was in her early twenties she was abused by a white man and bore a son, the only child she would ever have. This page displayed 54,444 times.